The 400,000 stateless Palestinians living in Lebanon live with many restrictions, not being allowed to attend public school, own property, or even improve their housing stock - regulations that exist so remind Palestinians that they are refugees and should one day return whence they came. In 1994, under Syrian influence, the Lebanese government relented a bit and distributed citizenship to tens of thousands of Palestinians. June 28, 2005 update: In a reversal from two years ago, and perhaps related to the reduction in Syrian influence in Lebanon, the new government is making plans to permit Palestinians to obtain work permits, writes Rym Ghazal in the Daily Star. The Lebanese government announced it will finally allow Palestinian refugees born in Lebanon to legally work at manual and clerical jobs in the country, ending 20 years of discrimination. In an official statement, Lebanon's outgoing Labor Minister Tarrad Hamadeh said: "From now on Palestinians born on Lebanese land and registered officially with the Lebanese Interior Ministry will be allowed to work in the jobs previously unavailable to them." The move brings Lebanon more in line with other Arab countries who long ago granted Palestinian refugees the right to work, and have in some cases offered them citizenship. But despite the measure, the Lebanese government insisted a ban on Palestinians seeking professional employment will remain in place, meaning Palestinian workers will be restricted to manual and clerical work. There are around 400,000 registered Palestinian refugees living in Lebanon, 90 percent of whom were born in Lebanon and will be eligible to work. Anyone aged 57 and below will benefit from the work permit. July 16, 2005 update: According to the Syrian Arab News Agency, a ranking figure in Hizbullah, Hussein Mosawi, reiterated his party's rejection of any talk about settling the Palestinians in Lebanon, saying that this "serves Israel" by "liquidating" the Palestinian question and particularly the right of return. May 6, 2007 update: Bad as conditions are for the bulk of the roughly 400,000 Palestinians residing in Lebanon, there's a yet worse-off category, that of the document-less or "invisible" Palestinians, estimated to number between 3,000 and 5,000, as Nada Bakri explains in "Invisible Palestinians Exist in Legal Limbo in Lebanon." She tells the story of the Hamdallah family, starting with Moetaz Hamdallah, 65, born in Jerusalem, who arrived in Lebanon in 1970 from Jordan after the "Black September" uprising. Expelled from Jordan, Hamdallah reached Lebanon at a moment when the Palestine Liberation Organization ran southern Lebanon, so he did not bother legalizing his status with the Lebanese state. "The revolution was strong, I was strong. I never thought about identification papers or what would happen to me and to my children without them." When Mr. Hamdallah's oldest son, Mohannad, 34, was a child, he asked his father why he did not have an identification paper like his fellow classmates. He was told that he would get papers when they returned home ­ meaning Jerusalem, he said. Recently, when Mohannad Hamdallah was asked how he would respond if his 7-year old daughter, the oldest of a third generation of refugees in his family without identification, someday asks him why she cannot graduate from school, he thought for a moment before answering. "I would tell her they were burned during the war," he said. Today, some 300,000 Palestinian refugees reside in Lebanon and constitute nearly a tenth of the country's population.… They also remain subject to various restrictions in the host country, Lebanon, which places them in a situation akin to that of second class citizens and denies them access to their full range of human rights, even though most of them were born and raised in Lebanon. … Just over half – some 53 percent - of Palestinian refugees who live in Lebanon, reside in war-torn, decaying and poverty-stricken camps. The conditions for those living outside the camps in towns, "gatherings", villages and rural areas, are also poor. The ghettoization of Palestinians is intensified by the constant military presence around the camps in southern Lebanon. Each time refugees want to leave or return to their homes, they have to pass an army checkpoint and show their documents, reinforcing a perception that they are outsiders and a potential threat, rather than refugees in need of protection. The discrimination and marginalization they suffer is compounded by the restrictions they face in the labour market, which contribute to high levels of unemployment, low wages and poor working conditions. Until 2005, more than 70 jobs were barred to Palestinians - around 20 still are. The resultant poverty is exacerbated by restrictions placed on their access to state education and social services. Apr. 23, 2008 update: In a statement seemingly out of nowhere, Mahmoud Abbas told reporters as he traveled to Washington that Israel and the Palestinian Authority (PA) are dealing with the issue of Palestinian refugees and, "If a deal is signed between Israel and the PA, no Palestinian refugee will be left in Lebanon." Comment: Given that the Olmert government certainly is not about to allow 300,000 Palestinians from Lebanon into Israel, Abbas seems to be implying that he expects to reach an agreement with Israel that permits them to settle in the West Bank and Gaza. If so, that is news because until now, the PA has insisted that refugees must be settled into Israel, not the territories. This report examines housing, land and property ownership, as well as rights, transfers, and law related to Palestinian refugees living in the Gaza Compound in Sabra, Nahr el-Bared Refugee Camp in North Lebanon and the adjacent area to Nahr el-Bared (hereafter the Adjacent Area) in order to better understand their situation. The report proposes a series of recommendations to assist the Norwegian Refugee Council and the broader humanitarian community to improve the housing, land and property ownership rights of Palestinian refugees in Lebanon. No real right of any kind may be acquired by a person who does not carry a citizenship issued by a recognised state or by a person if such acquisition contradicts with the provisions of the Constitution relating to the prohibition of permanent settlement of Palestinians. Even though the provision includes all people who do not carry a citizenship issued by a recognised state, it is quite clear from the interpretation of the Law that the amendment is directly aimed at prohibiting Palestinians from property ownership. The rights of Palestinians were affected greatly by the new Law; previous to the amendment, Palestinians were able to own a maximum area of 5 000 square meters without a prior permit. The Law imparted a wide range of new prohibited legal actions. It prohibits Palestinians from the acquisition of all real rights, including the transfer of real rights by inheritance, donation, testament, etc., any lease contract for a period of 10 years and above is subject to a prior license and the real rights of a deceased Palestinian cannot be transferred to the Palestinian heirs but become the property of the Islamic Waqf. caught between a past they can't escape and a future they struggle to shape, renting out the top floors of their building — which technically they don't even own. Like the rest of the 400,000-odd Palestinians in Lebanon, they cannot legally buy a house or apartment and remain barred from some 70 professions. Lebanon's fragile sectarian political system, balanced between Christians and Muslims, has been unable or unwilling to absorb so many Muslim refugees. So neither Sulhani, nor his children, nor his grandchildren, nor his great-grandchildren have Lebanese citizenship, despite the fact that all but the family patriarch were born on Lebanese soil. "My life in this country has been one heartbreak after another," says daughter Ahlam. "I have no good memories." AMMAN, Jordan — Muhannad Haddad grew up here, went to school here, got a job in a bank here and traveled to foreign countries with a passport from here. Then one day the authorities said he was no longer Jordanian, and with that one stroke they took away his citizenship and compromised his ability to travel, study, work, seek health care, buy property or even drive. The authorities effectively told him they were doing it for his own good. They said that like thousands of other Jordanians of Palestinian descent, he was being stripped of his citizenship to preserve his right to someday return to the occupied West Bank or East Jerusalem. "They gave me a paper that said, 'You are now Palestinian,' " he said, recalling the day three years ago that his life changed. In a report titled "Stateless Again," issued last month, Human Rights Watch said that 2,700 people in Jordan lost their citizenship from 2004 to 2008, and that at least another 200,000 remained vulnerable, largely those who moved abroad at some point in search of work. The government says it is trying to help by requiring Jordanians of Palestinian descent who fled the West Bank or Jerusalem after the war in 1967 to keep their Israeli documents valid. This has become a more urgent matter recently, political analysts and government officials said, with the accession of a right-wing Israeli government and its ultraconservative foreign minister, Avigdor Lieberman. "It is no secret that some elements in Israel would like to see the Palestinian areas without the people," said Nabil Sharif, Jordan's minister of state and a government spokesman. "We do not want to be party to this." the bill was a step forward in improving their status, but fell far short of alleviating their isolation in 12 camps scattered across Lebanon, where many rely on employment with United Nations agencies or settle for low-paying jobs in construction and services. … The law lifts restrictions on Palestinians' employment in the formal labor market, though they would still be officially treated as foreigners. They would be barred from working as engineers, lawyers and doctors, occupations that are regulated by professional syndicates limited to Lebanese citizens. Though the law fell short of some refugees' hopes, many welcomed it, in particular the law's granting of access to social security benefits to refugees. "I am 51 years old, born and raised here, and this is the first time I feel like I am a human being," said Abu Luay Issawi, who owns a grocery store in Mar Elias, a refugee camp in Beirut. Electricity was out in the camp on Tuesday. No water was running, as is the case almost every day in Mar Elias, which is overcrowded and lacks basic infrastructure. Palestinian refugees, who constitute nearly a tenth of the country's population, have long been denied basic rights in Lebanon. They are not allowed to attend public schools, own property or pass on inheritances, measures Lebanon says it has adopted to preserve their right to return to their property in what constitutes Israel now. The legislation does not address any of those issues, though some lawmakers have said they may push for greater rights in coming months. "The second battle is the right to own property," said Walid Jumblatt, a lawmaker and Druse leader who introduced the legislation in Parliament. Six months ago, the Lebanese government was internationally applauded for passing legislation granting the Palestinian population the right to work. But real changes remain to be seen. On Feb. 22, the caretaker labor minister, Boutros Harb, signed a decree on carrying out the August 2010 labor law amendments. Final approval by the Shura Council, the country's highest court, is now awaited. Meanwhile, questions about the potential effectiveness of the legislation and the employment situation of the refugees linger. "What we have now is, we have a legal framework, we have a technical framework," said Nada al-Nashif, the regional director of the International Labor Organization, an agency of the United Nations. "These are logistical parts of the equation. "Now of course you have to overcome lots of mistrust, a lack of confidence, lots of fears imbedded in the system through a rather negative experience over the years, for the Palestinian population especially." Sari Hanafi, an associate professor at the American University of Beirut, predicts that the change "will have a tiny impact" because Palestinians will still be barred from working in such professions as medicine, law, and engineering. "Unless the liberal professions are addressed," Hanafi insists, "this law doesn't have any impact." Also, the article cites a December 2010 study released by the American University of Beirut which found just 37 percent of working-age Palestinians living in Lebanon employed. June 3, 2011 update: The law firm of Allem & Associates has posted a study on Foreign Ownership of Real Estate in Lebanon. 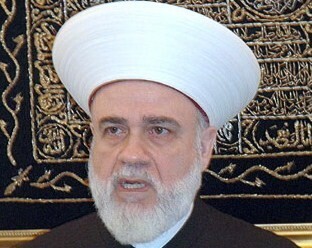 Mohammed Rashid Qabbani, the Sunni mufti of Lebanon. June 16, 2011 update: Slightly off topic but indicative of attitudes toward Palestinians in Lebanon: Mohammed Rashid Qabbani, Sunni mufti of Lebanon, told off a Palestinian delegation in his office to discuss Palestinian encroachments on state-owned and Islamic waqf (mortmain) lands, "We've hosted you and no longer want you." Accusing Palestinians of "usurping" Wakf lands to build houses, Qabbani told his visitors: "I will defend Wakf lands – even if that costs me all what I have." Attempts by the Palestinian representatives to muzzle the mufti further enraged the top religious official, who at one point shouted at them: "You are trash. You [Palestinians] will never be victorious. Nor will your cause. I'm no longer afraid of your weapons." … The furious mufti later kicked the Palestinian representatives out of his office. 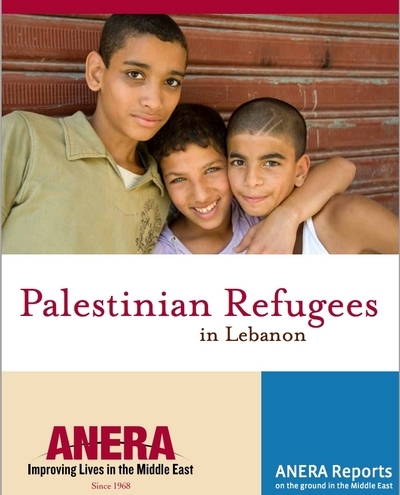 June 1, 2012 update:The American Near East Refugee Aid (ANERA) has published a study titled "Palestinian Refugees in Lebanon" that covers this population's problems in some detail. It lists problems but, presumably out of political discretion, does not lay blame on anyone for them. Sep. 10, 2012 update: Picking up on the Jordanian topic initiated above (see the Mar. 13, 2010 update), Ali Younes suggests in "Revoking citizenships: The future of Palestinians in Jordan" that denying Palestinians Jordanian nationality has not to do with priming them against Israel but concerns internal tensions in the kingdom. Younes quotes Bassam Badareen a foremost expert on this issue: "Denationalizing Jordanian citizens is carried out by secret instructions by a secret committee within the intelligence and security agencies and its sole purpose is to scare the Palestinians in Jordan from demanding their civil and electoral rights." Palestinians in Lebanon are banned from working as doctors, dentists, lawyers, engineers or accountants. By contrast, anyone visiting an Israeli hospital or medical center would quickly notice the presence of a significant number of Arab doctors, nurses and pharmacists. Human rights activists say the Lebanese government is now using the war in Syria and its impact on Lebanon to avoid abolishing the Apartheid laws. This, of course, is a weak excuse: the anti-Palestinian Apartheid laws have been in effect long before the crisis in Syria erupted.